The SCORE statement applies the contents of the source item store to compute predicted values and other observation-wise statistics for a SAS data set. specifies the name of the output data set. If you do not specify an output data set with the OUT= option, the PLM procedure uses the DATAn convention to name the output data set. specifies a statistic to be included in the OUT= data set and optionally assigns the statistic the variable name name. Table 75.9 lists the keywords and the default names assigned by the PLM procedure if you do not specify a name. Prediction limits (LCL, UCL) are available only for statistical models that allow such limits, typically regression-type models for normally distributed data with an identity link function. Zero-inflation probability (PZERO) is available only for zero-inflated models. For details on how PROC PLM computes statistics for zero-inflated models, see Scoring Data Sets for Zero-Inflated Models. 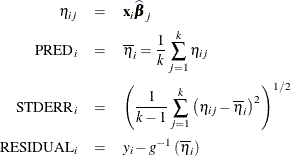 specifies the degrees of freedom to use in the construction of prediction and confidence limits. requests that predicted values be inversely linked to produce predictions on the data scale. By default, predictions are produced on the linear scale where covariate effects are additive. requests that the offset values not be added to the prediction if the offset variable is used in the fitted model. requests that names not be made unique in the case of naming conflicts. By default, the PLM procedure avoids naming conflicts by assigning a unique name to each output variable. If you specify the NOUNIQUE option, variables with conflicting names are not renamed. In that case, the first variable added to the output data set takes precedence. requests that variables from the input data set not be added to the output data set. requests that statistics in models for multinomial data be written to the output data set only for the response level that corresponds to the observed level of the observation. where denotes the inverse link function. The LCL and UCL statistics are not available with the SAMPLE option. When the LCLM and UCLM statistics are requested, the SAMPLE option yields the lower % and upper % percentiles of the predicted values under the sample (posterior) distribution. When you request residuals with the SAMPLE option, the calculation depends on whether the ILINK option is specified.